The grandkids Hans (11 y/o boy) and Goldilocks (5 y/o girl) were coming for most of the weekend. We were all excited because the weatherman had been promising-teasing-hinting-suggesting we would have snow. We were hoping-wishing-anxious-bouncing (off the walls) with anticipation. Every 10 minutes someone was checking out the window or checking the temperature. By 9pm, Goldilocks had climbed into Granddad’s lap and was asleep. By 11:30 Hans was still checking the temp and out the window when he decided maybe we should all go to bed and hope the miracle happened during the night. 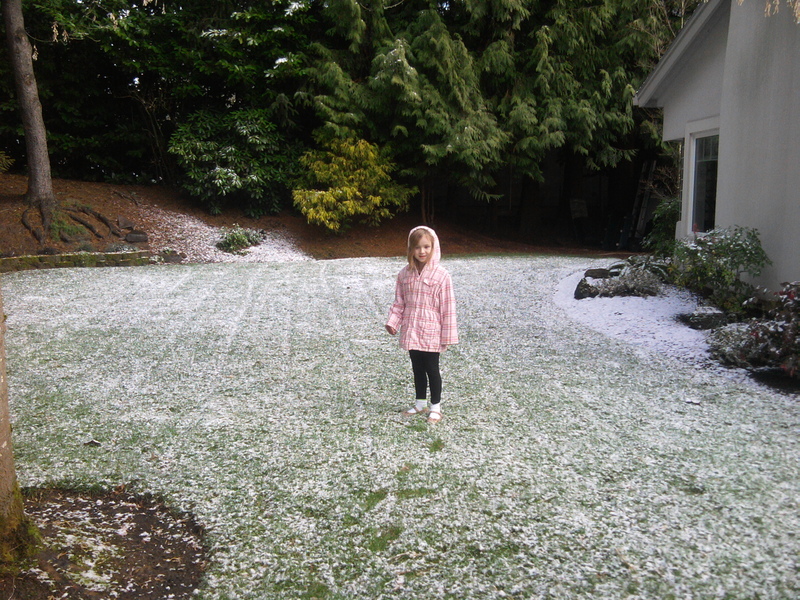 At 8am, two excited kids bounced into our room to let us know it was snowing. Yes, it was. You could count the flakes as the fell, tiny little things, one or two a second. They melted on contact. We got dressed, ready and headed out to Denny’s for breakfast. It has become a Sunday morning ritual. Hans and Goldilocks look forward to going out for Pancake Puppies when they spend the night on Saturday. Still no snow. We came home where little flurries kept teasing us all day, but never enough to even cover the ground. Then about 2:30 the big flakes fell fast and furious and within 15 minutes we had a glorious covering of snow. The sun peaked out the snow was melting in less time than it had taken to accumulate. Goldilocks was jumping and dancing, “Come on, Grams. We gotta go play in the snow.” We grabbed our shoes and jackets and headed out. To play. To build a snowman. With less than 1/8 inch of snow on the ground; in the places there was any snow. Come On! We Have to Play!! We Can Build a Snowman!!! We couldn’t take time to find gloves or the snow would be gone. With nothing more than our bare hands we began to build a snowman. We rolled a big ball for the body, a smaller one for the head and then added the accessories. 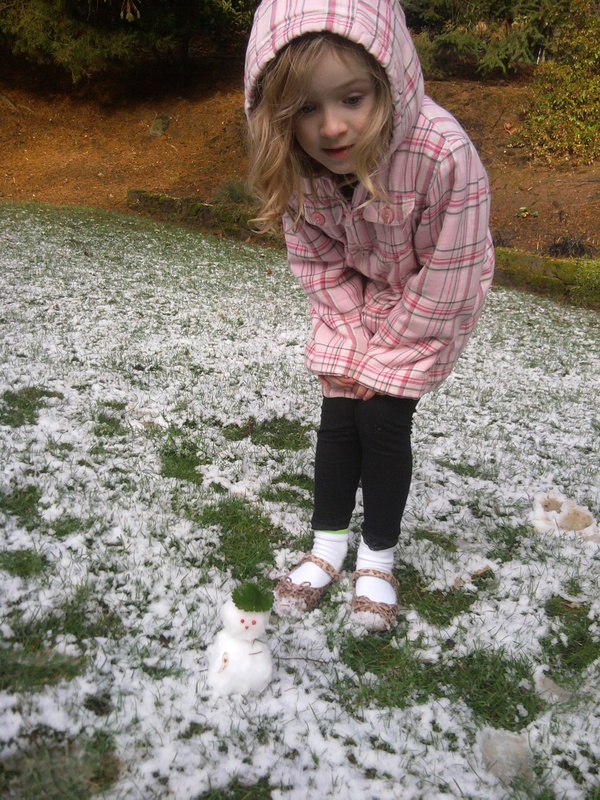 Goldilocks took the time to pose with her first snowman of 2012. She was most proud of how he looked. She wanted to add arms, but finding such tiny sticks was a challenge. So she decreed that we built a snow cat. 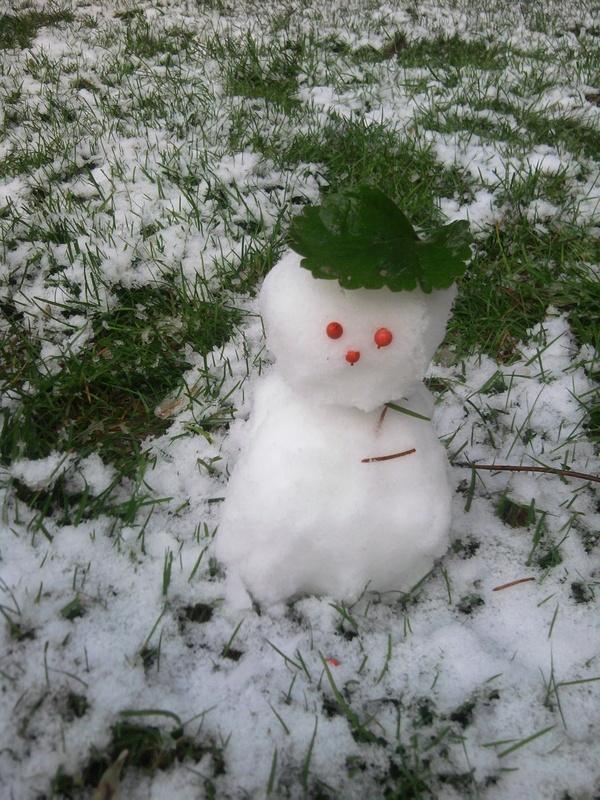 Last but not least, a portrait of Snowman #1 2012. And there you have it. The miracle snowman. Do you know how hard it was to find enough snow to build a snowman? We think he turned out very cute!! At dusk he was still sitting all alone on the grass, which by then was completely green with no snow in sight. He may last through the night because the temperature dipped below the freezing mark just before dark. Hope you had a fun day, too!